For a really unusual gift to mark a special occasion, like a landmark birthday, stag or hen do, or as a leaving present, it could be time to look to the skies for inspiration! If your friend or relative has a bit of a wild streak and a taste for adventure, they really will be walking on air if you choose an air-borne present to surprise them with! 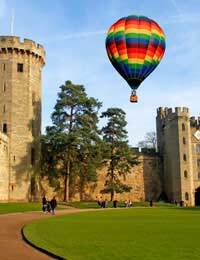 Hot Air Balloon Flights:There are lots of companies around the country offering hot air balloon flights. Some can be as simple as an up-and-down float across the countryside; others are pull-out-all-the-stops once in a life time experiences, with champagne, luxurious nibbles, and a commemorative certificate all included in the trip. But warned though – hot air balloon flights aren't for everyone! Before you splash out on an all expenses paid trip for your nearest and dearest, it might be prudent to make some discreet enquires to rule out fear of heights or flying so your present doesn't end up a being a (flying!) white elephant! Helicopter Rides:What could be more exciting than taking to the skies over your home town and observing all the sights from a magnificent vantage point? Or riding high over some famous landmarks and points of interest? Helicopter flights can make a fantastic present for adults and children alike, whatever the occasion. Most companies offer packages and deals that allow you to either book out the whole helicopter for your group, or take a flight with other passengers. Some companies offer themed flights and special celebratory packages – but make sure you do your research to get the optimum experience for your money! And remind the recipient to take a camera to capture the fantastic scenery! Gliding:Gliding will definitely only be on the agenda if the birthday boy or girl is a bit of an extreme sports fanatic! This one isn't for the faint hearted! But for the right person, this really would be the experience of a life time – being winched up into the air to approximately 2000 feet in a dual controlled machine, before being released into the skies! Most companies offer the passenger the opportunity to co-pilot the glider and really get an awesome hands-on experience! Flying Lesson:If you have a friend or relative who's always fancied themselves as a bit of a 'Top Gun', then why not treat them to a flying lesson so they can really indulge in their fantasy! Flying schools around the country open their doors to one-off flyers and provide flying days and gift vouchers for the ultimate gift for that special occasion. Whatever type of airborne treat you decide to splash out on, always bear in mind that some packages and activities won't be suitable for everyone – some might have height, weight or age restrictions for example, or some might have rules and regulations in place if the recipient of your gift has certain health complaints or mobility difficulties – always check and double check the terms and conditions of the gift voucher before buying – and make sure your intended flyer doesn't have any flying-related phobias!